Support Vector Machines (SVMs) are some of the most performant off-the-shelf, supervised machine-learning algorithms. 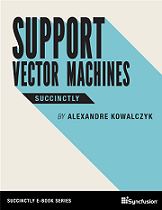 In Support Vector Machines Succinctly, author Alexandre Kowalczyk guides readers through the building blocks of SVMs, from basic concepts to crucial problem-solving algorithms. He also includes numerous code examples and a lengthy bibliography for further study. By the end of the book, SVMs should be an important tool in the reader's machine-learning toolbox.